The day was breezy and cool, but sunny. I dressed warmly, grabbed my journal supplies and drove into Yellowstone. My goal was to find a place to sit and draw and write—to slow down. Blacktail Trailhead beckoned and I parked, grabbed my gear and headed out with the intention of wandering and sitting rather than hiking and covering miles. It is always a tough choice. I love to move but I am learning to love to ‘be’. My habit has been to choose activity over stillness and that habit is a hard one to change. My body needs challenge but more and more, my mind requires the challenge of sitting and drawing. Observe. Remember. Wonder. Love. These are the reasons I journal. Moving, I can only observe so much, only give so much attention to what I see. 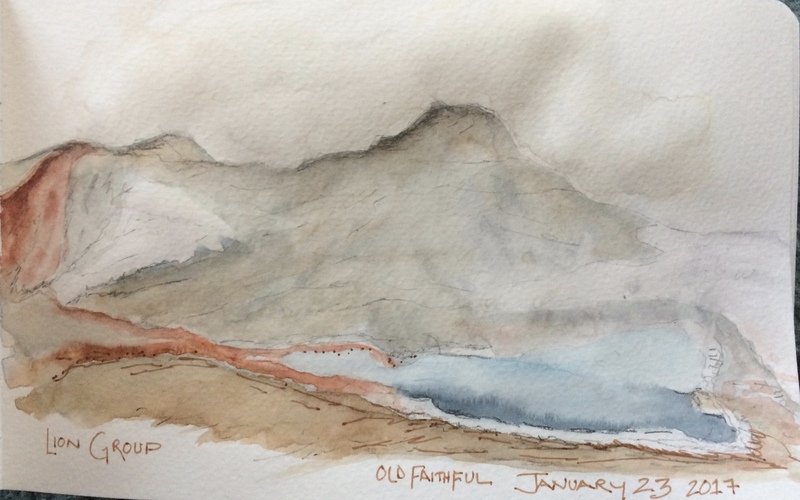 Journal drawing slows me, slows time and gives me the opportunity to really see. Whether a flower, the landscape, or a creature; I come to know that thing better through observation. 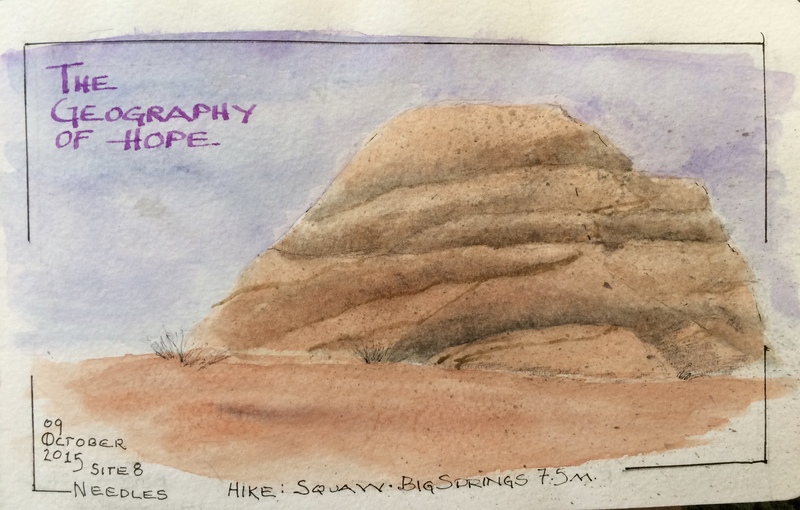 Nature journaling helps me remember. I look back at journal pages and am transported to where I was when I drew or wrote. I smell the smells, see the sights, feel the temperature and the breeze. Better than photographs, my journals represent my life. Wonder: questions and thoughts come up while I draw or write. Or quotes. Or word descriptions. How do those feathers attach to that wing? Why do pasque flowers seem to be blooming early this year? Pinyon Pine have unpredictable bumper crop years which allows some seeds to escape the bellies of squirrels or birds. I become a better naturalist by asking questions and looking for answers; my curiosity peaked about my world. When we give full attention to something—a child, our partner, a friend, a flower or a landscape, we develop and deepen our relationship. We call this love. To love something, to fall in love with something, requires our full attention. I have fallen in love with yellow flowers, with mountain peaks, with rivers, with red rock canyons. Plato wrote ‘An unexamined life is not worth living.’ My journals go back years, most of which I have no desire to re-read. Over time I have evolved into my niche—melding wildlands passion with the joy of drawing and writing. An early entry: First kayak trip, Great Lakes. I remember huge grey waves, fear, cold rain and the pain of learning to paddle for the first time. I also remember laughter and joy with a new husband and good friends. Mojave: I remember winds, sun, camping in Hole in the Rock with Teresa, in awe at the yucca flowers. Yellowstone Lake: Kayak trip with Jane and Diane. High waves and coming into shore trying to avoid rocks. Laughing so hard we cried. 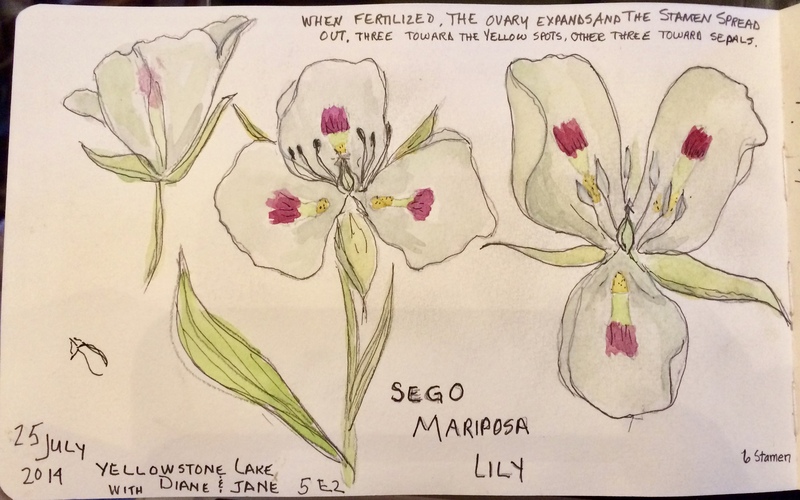 Hiking through more Sego/Mariposa Lilies than we’ve ever seen. Stopping to photograph and just look. My first close look at these flowers, recording what I learned from observation. Two years, two winter trips to Old Faithful with Diane. Next year will be our 10th “Old Faithful Winter Adventure” Anniversary, and we look forward to many more! 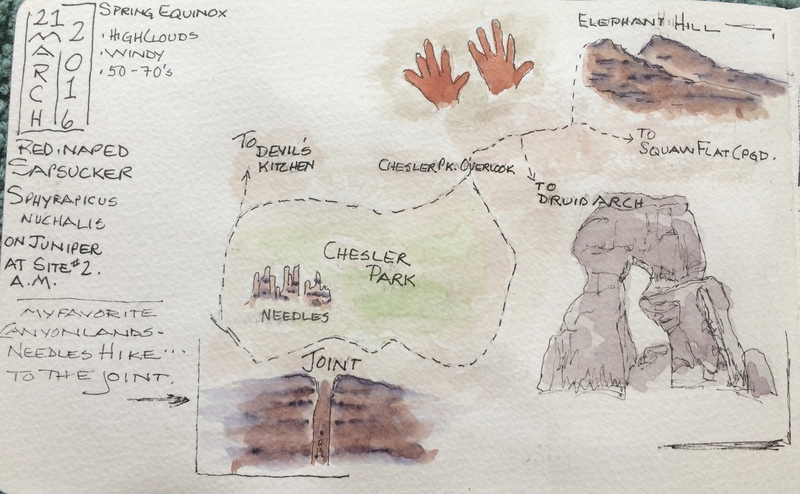 One year ago: ‘Walkabout’ event map of a day hike in Canyonlands. It was a perfect day for hiking my favorite trail. And I’ve now got a record of the Red-naped Sapsucker! 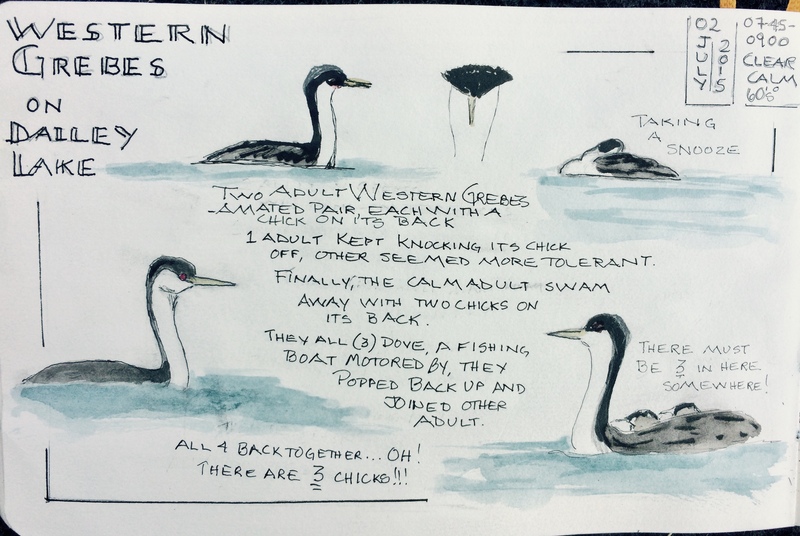 While not ‘beautiful’, I love this journal entry because as I watched these Western Grebes through my spotting scope, I discovered new-to-me information. This page is a record of what I learned. “One-eye” trip to Canyonlands, Utah. This page is about not only hope for our wild lands, but hope for the eye problem that I was dealing with at the time. My eye issue is mostly resolved, but our wildlands continue to need our support. If you are interested in nature journaling, there are many good books and some excellent classes. The Laws Guide to Nature Drawing and Journaling by John Muir Laws and How to Keep a Naturalist’s Notebook by Susan Leigh Tomlinson are excellent books. 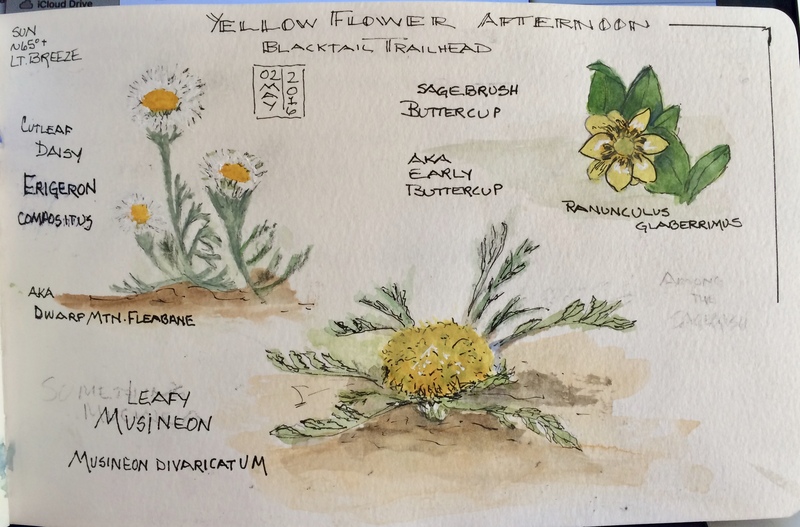 Gay Kraeger is an excellent instructor: her on-line class Illustrated Nature Journaling is available through Craftsy, or look for her on YouTube. 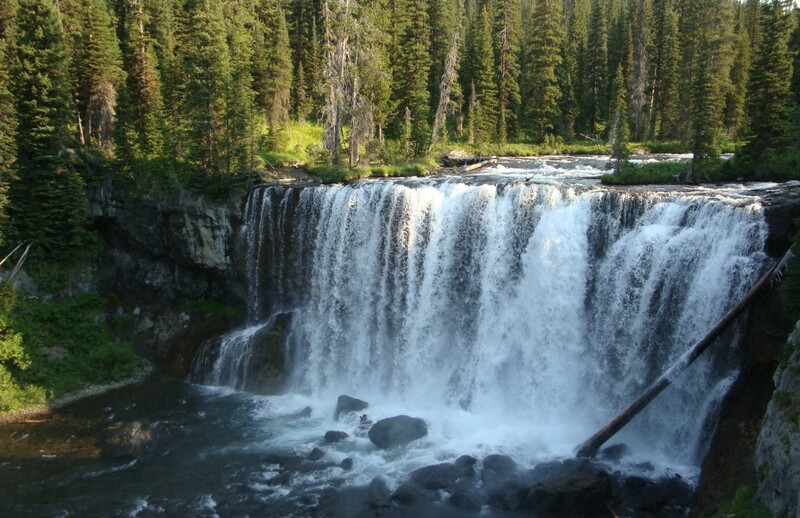 The Yellowstone Forever Institute offers many classes in Nature Journaling. Their website is http://www.yellowstone.org. Beautiful! Your art has improved so much over such a short period of time that it makes me think there’s hope for me if I just dedicate myself to it. Thank you, Joyce. While I try to create a pleasing page, it’s the act itself that is important. You know that saying about the journey…. Wow- I don’t remember you journaling way back on the kayak trip. Great post and perfect sentiment. It is so hard to just sit, not feel guilty about not moving. It’s important to achieve a balance, especially as we get older. Yes, Teresa! I bet you’ve got some stuff from back then, too! What a wonderful vehicle your journal is, Julianne!! – the native slate to record rich observations, the homespun parchment to bare a searching soul. Anchored to Bradbury, Plato and Proust, these journal transforms keen observations to the philosophy of life. Slowing Down adds many dimensions missed when speed is the premium. And perhaps your Marcel Post quote states it best: “The real voyage of discovery consists not of seeing new landscapes but in having new eyes””. Thank you for your lovely words, John. You’ve the heart of a poet. That is really awesome and I am envious of your artistic ability. 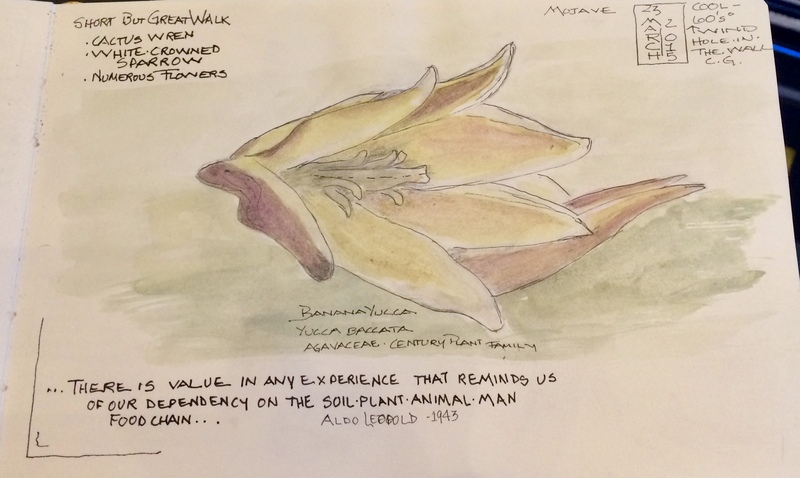 Your flower drawings reminded me of the work of Ed Stuhl, one of the great advocates for preserving the wilds here in Northern California. Thanks for your kind words. I like learning new things and drawing is something I loved as a kid. So getting back into it. I will check out Ed Stuhl. Thanks for the info. 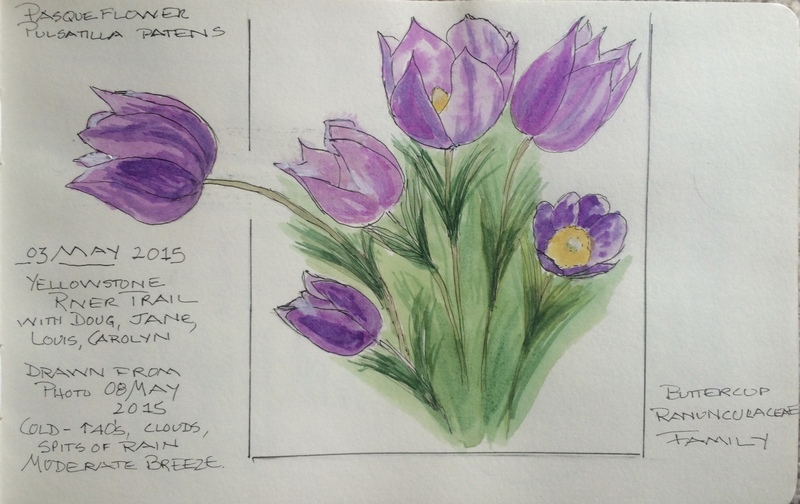 Loved this post Julianne and your nature journaling. This is something I want to pursue. I will be bringing some supplies with me to YNP this summer. I love this, Julianne. I might just pick up one of these books and try it for myself. Thanks for the suggestions. Thanks, Lisa. The John Muir Laws is the perfect ‘one-stop shop’ book. If I could only get one , it would be his. And I think Y F has them in stock… at least they did recently. Enjoy! Thanks, Mike. We use what we can and a camera is a great tool to capture and remember. Your Journal entries are exquisite! You include detailed written descriptions with your incredible drawings and watercolors. Very impressive work. You have developed so many talents since you left Michigan. Your work reminds me of three books in my library: Keeping a Nature Journal ~ Clare Walker Leslie & Charles E. Roth. © 2000. Also: A Trail Through the Leaves ~ (The Journal as a Path to Place) Hannah Hinchman © 1997. Hannah’s later book is Little Things in a Big Country © 2004.